Buccellati celebrated its New York flagship store opening with an exhibition of Impressionist and Post-Impressionist tableaux. Buccellati, the renown High Jewellery Italian Maison, celebrated last March 12 the opening of its new 5-storey flagship store, located at 714 Madison Avenue, New York, with an exhibition titled “Timeless Blue”. On this occasion, five one-of-a-kind high jewellery creations were showcased, inspired by Claude Monet, Pierre Bonnard, Homer Winslow, Mikhail Larionov and Odilon Redon paintings – a courtesy of Wildenstein & Co.
With Italian Renaissance always at the core of Buccellati’s aesthetic views, Andrea and Lucrezia Buccellati did found a new source of inspiration in the Impressionist and Post-Impressionist artistic mouvements. These five unique jewels take in fact Buccellati into the 21st century, by indicating a new approach and a timeless elegance, with the Maison’s tradition evolving towards the modern world. Monet’s Tempête sur les Cotes de Belle-Ile. Fabulous one-of-a-kind earrings inspired by ‪Claude Monet‬’s painting. As in Monet’s painting, the light is captured within the honeycomb surface of the white gold pendant earrings and then magnified by the Paraiba tourmalines and diamonds. Winslow Homer’s Light Blue Sea at Prout’s Neck. This bracelet inspired by a 1836 painting by Winslow Homer and handcrafted with the Tulle technique, reproduces the sensual movement of the waves, the tumultuous splashes of the white foam upon them, entirely set with diamonds. Odilon Redon’s La Chute de Phaéton. “The painting of ‪‎Odilon Redon‬’s entitled La Chute de Phaeton made me imagine dreams of flying so I designed these ear cuffs like wings” – Lucrezia Buccellati. Pierre Bonnard’s Deux Vases de Fleurs. Mikhail Larionov’s The Spider’s Web. One-of-a-kind ring inspired by Larionov’s painting. One-of-a-kind ear cuff inspired by Redon’s painting. 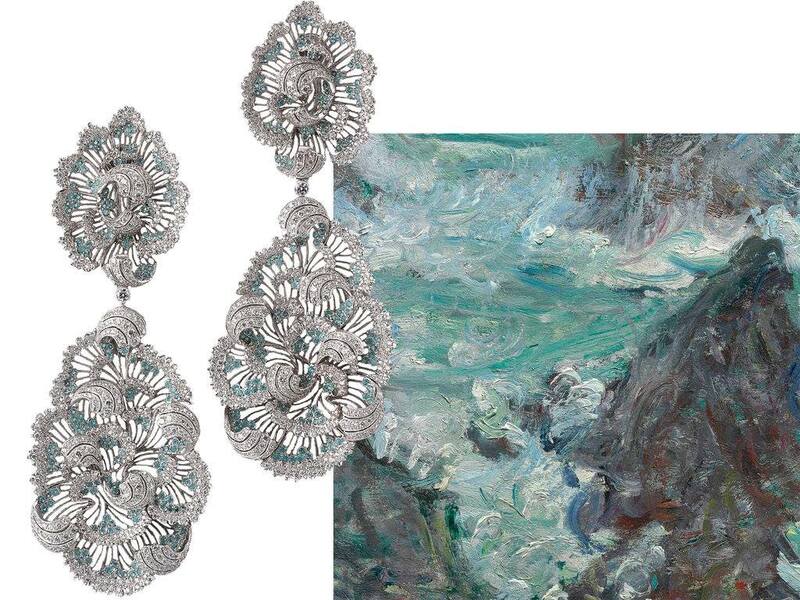 One-of-a-kind pendant earring inspired by Monet’s painting. Jewellery & Art Exhibit – ambiance. Indre Rockefeller, Alberto Milani, Kelly Rutherford. The name of the event, “Timeless Blue”, speaks of this colour as the fil rouge of Buccellati’s stylistic identity, initiated by the Maison’s Founder, Mario Buccellati – at the event the color blue was accentuated by two blue Maseratis at the entrance door and a Timeless Blue cocktail: a blue scenery welcoming quite a few socialites, fashion gurus and top international clients, among whom we will mention Kelly Rutherford, Wes Gordon, Indre Rockefeller, Olivia Chantecaille, Adelina Wong Ettelson, Alexandra Lind Rose, Beatrice Rossi-Landi, Alison Wright and Ashley Smith. An evening which was to support the Save Venice Foundation, an organization based in New York which mission is to restore architectural and artistic works of art in Venice. Post by Claudia Carletti, Jewellery Through Time. Material courtesy of Buccellati Press Office.